Browse: Home / How does your garden grow? Very well! Thanks to the crew of A&M students that helped us clear the grass, Brian’s hard work in tilling the plot and plenty of rain, sunshine and mulch. 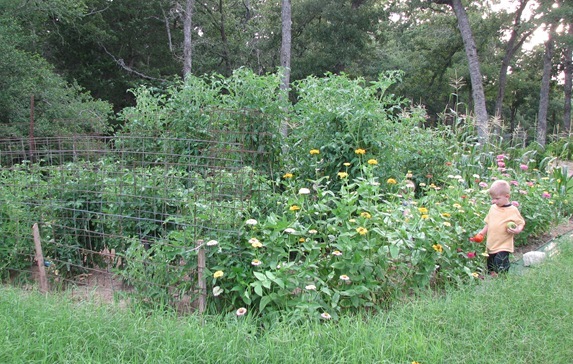 This is the view from one end of the garden – mostly tomatoes and flowers. 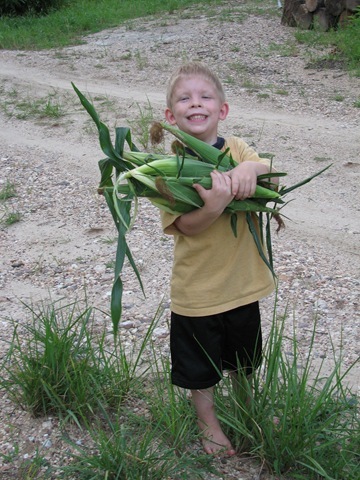 This side shows the corn crop which we have just finished harvesting! The metal panels around the edge help control the Bermuda grass – a tenacious weed. Watermelon is growing all among the corn rows. 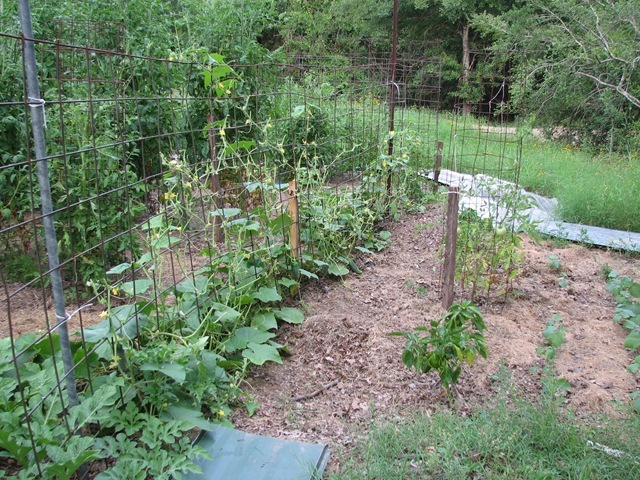 This view is the back side of the garden where our cucumber vines are climbing. On the extreme right edge you can see little okra plants. Something ate the upper leaves on our cucumbers so we tied the dog nearby for several nights and managed to deter our visitor. 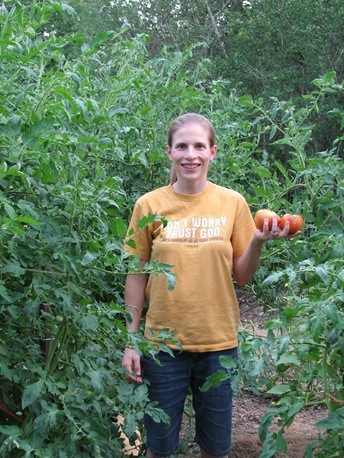 We have gigantic tomato bushes that are a good foot taller than me! The Zinnias have put forth probably a hundred blooms – so pretty! It’s nice to have them on hand to cut and take to people that need their day brightened. 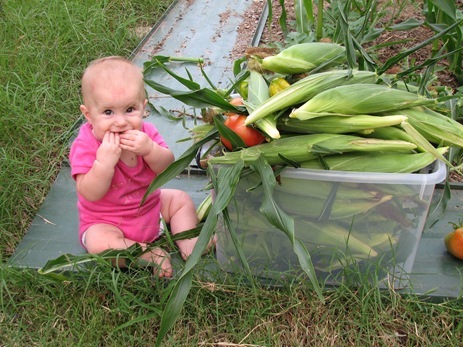 The corn harvest was particularly fun. 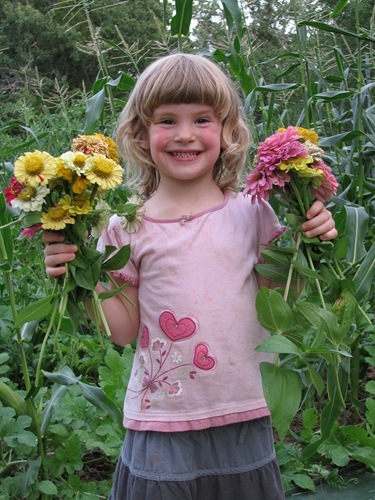 I wish I had a picture of the day they picked 20 cucumbers – they were so excited! It’s almost like a treasure hunt searching among the leaves. 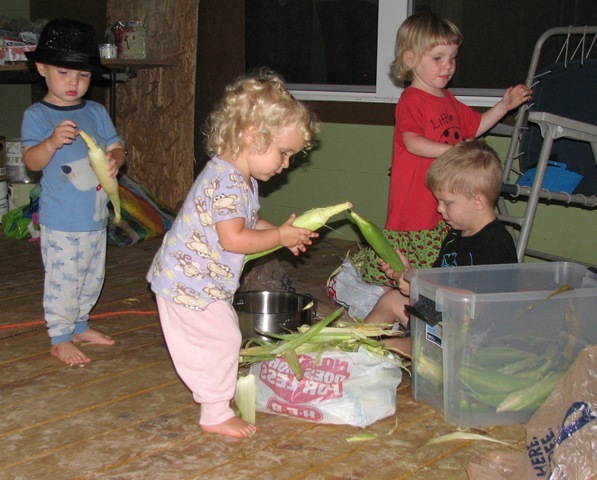 And the best part was the corn shucking party! This was a particular favorite for the two year olds – they were intensely occupied for at least 20 minutes straight while I canned some pickles! 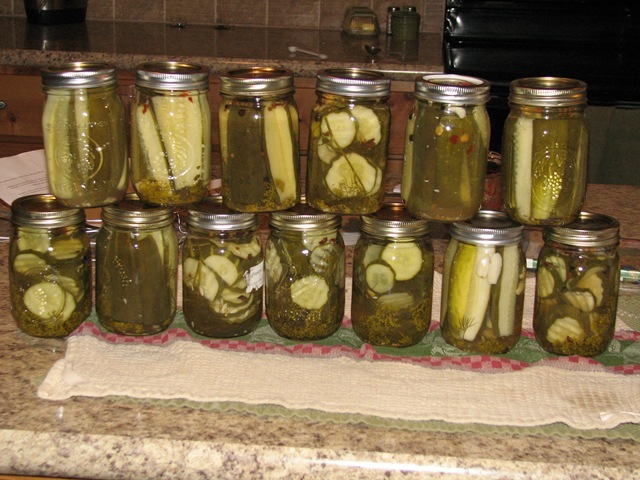 They are so fun and pretty in the jars! Now to process the corn! Boy, Iris looks like baby Amy in that picture! Wow!!! 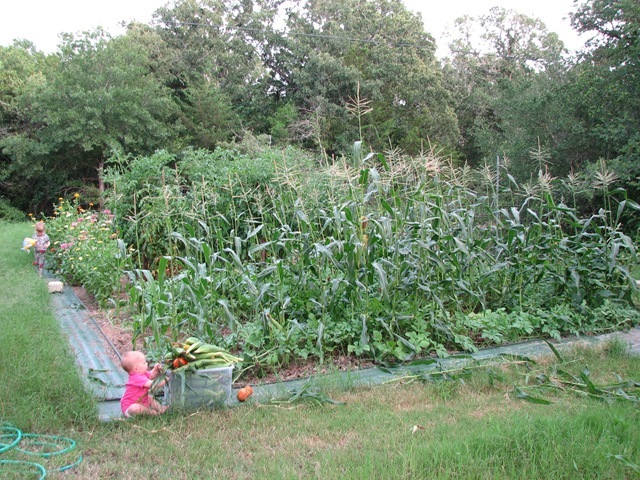 Love the garden and all the helpers. God has blessed you all tremendously. Rex and Sara need some garden pointers as the plot they built before the baby, all items died. Hmmmm. Have you seen the posts of their baby? Tabitha Grace Kyle has arrived and life is definitely very different. Continued blessings on your family. Great garden. Makes me hungry. And lots of good help.